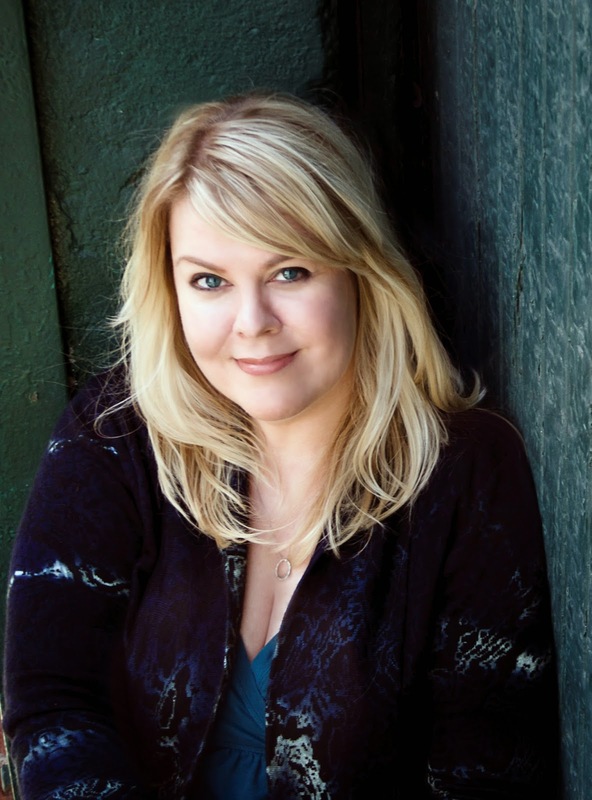 Two Chicks On Books: Interview with Morgan Rhodes and a Giveaway! Hey y'all! 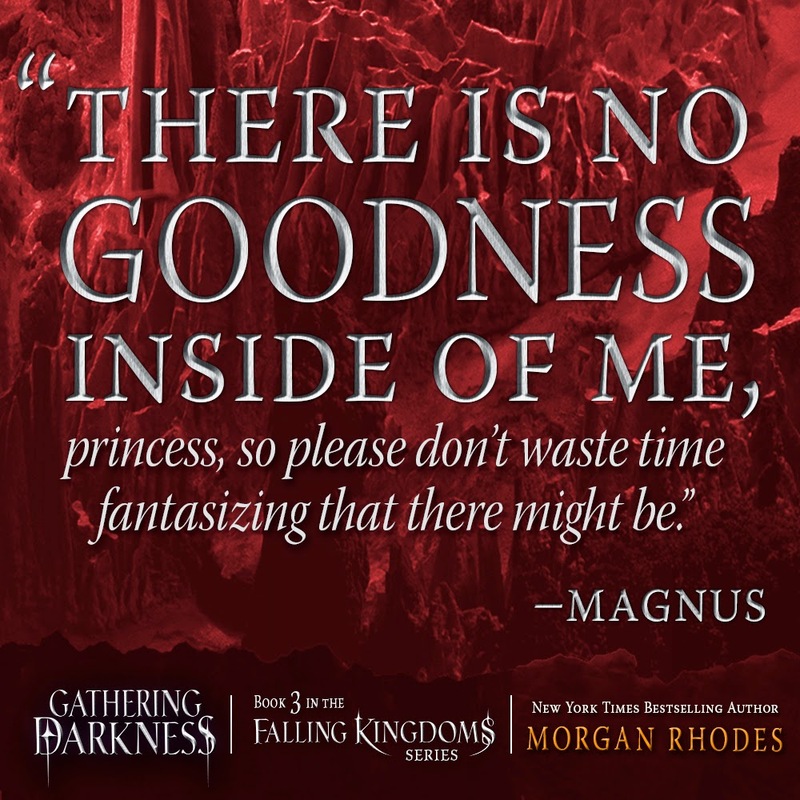 I have Morgan Rhodes here today to talk about GATHERING DARKNESS, book 3 in the Falling Kingdoms series and also she gives an answer about how many books there will be in the series. Check out the excerpt below and then come back for the interview. Oooooh and make sure to stick around and enter the epic giveaway! Haven't heard of GATHERING DARKNESS Check it out! 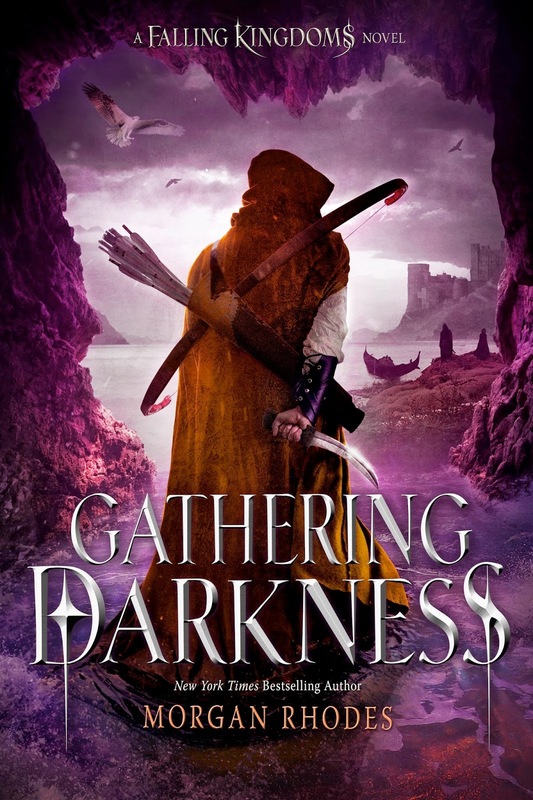 If you want to read an excerpt from GATHERING DARKNESS click HERE! I was pleasantly surprised to hear that the series was going to have more than 3 books. Was it always your intention to write 6 books? From the beginning, it was my hope and my wish for Falling Kingdoms to be six books, which seems to me like a perfect number for a high fantasy series. However, as a writer, nothing is ever guaranteed. So much depends on sales, reader interest, and publisher commitment. I sold the series two books at a time. By the time I started thinking about book four, I had to know – since the other books end on a cliffhanger – will there be the chance for two more? Or do I have to (try to) wrap up everything up with a neat bow by the end of the fourth? Happily, my publisher (Razorbill Books) agreed that we needed six books to tell the complete story in a wholly satisfying way. So…YAY! So can you tell us a little bit of what we can expect in GATHERING DARKNESS? The book picks up about a week after the end of Rebel Spring. Jonas is trying to find information on what happened to his lost rebels and meets a new recruit who could be a game-changer, and Magnus is dealing with the jarring news he learned about his father and what exactly to do about it. When a beautiful princess from the Kraeshian Empire arrives to join her brother Prince Ashur as (not necessarily welcome) guests of the king, Cleo begins to wonder if they could be friend or foe to her. A lot happens in this book and I hope readers are ready for a wild ride! Not directly. But I think for any writer, their characters are Frankenstein monsters of everyone they’ve met or heard about, little pieces here, little pieces there. What is your favorite passage/scene from the series so far and why? The first one that comes to mind is a scene near the end of Gathering Darkness between two characters who start speaking very dangerous truths to each other – about themselves and their own hearts. I’ll admit I’m a sucker for a tortured romance! I am a compulsive book buyer, so my TBR shelf is the size of a small mountain. Currently, I’m reading DUST by Joan Frances Turner, since I needed a zombie fix. Next up, I’m going to read LOLA AND THE BOY NEXT DOOR by Stephanie Perkins. ANNA AND THE FRENCH KISS is one of my favorite books ever, so I’m looking forward to finally reading the follow up! Thanks for stopping by Morgan I can't wait to read the rest of the series! 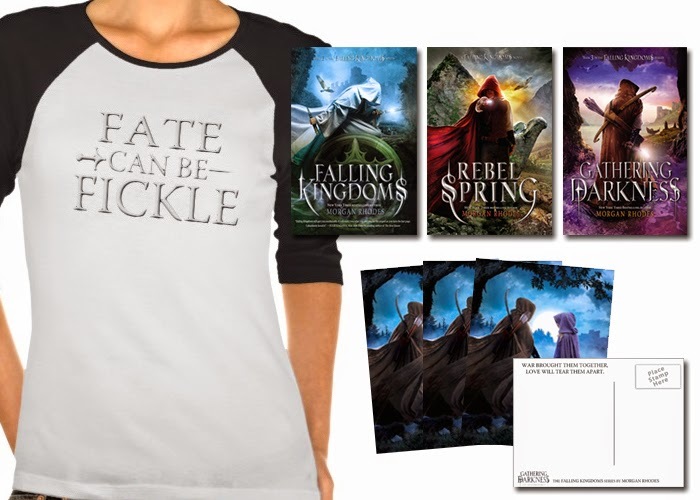 · plus copies of Falling Kingdoms, Rebel Spring and Gathering Darkness. I went and checked out the first book and this series sounds good! I can't wait to read it. Thanks for the giveaway! They all look amazing!! I can't wait to start this series!! I have not heard of this series before today, but it sounds like it has incredible details and vivid characters. I'd love to read all the books. Thanks for the incredible blog post and giveaway! I've seen this series before and am so glad! It pairs my love of YA and high fantasy! Great giveaway, that shirt's really cool. Thanks. I'm *dying* to read this series :) Hoping for a lot of Amazon gc's so I can totally splurge :) Thanks for sharing! Just bought Rebel Spring. I need to read that puppy! Finals need to be over now!!!!!!! I cannot wait to read Gathering Darkness! I put off reading Spring Rebel just so I can read them back to back. I love finding an exciting series to read! Thanks for the giveaway! I'm so happy you're able to tell your tale the way you originally meant it to be told. Thanks so much for sharing with us. Thanks for the giveaway, too. I am so excited to start reading this series! I love your answer to what inspired you to write ya. I love YA High Fantasy and would really like to read this series. And Adrian Ivashkov is my book boyfriend too! I have seen this series for the longest time. I just have too many books to get to before I could even read this series. Oh, gosh! This is like the only YA Fantasy Fiction series still continue to read with interest. I pretty mcuh abandoned Sarah J. Maas's series of the Throne of Glass series. It just came out of nowhere in different directions by the end Book 2. I also abandoned Leigh Bardugo's series Shadow and Bone. Falling Kingdoms series by Morgan Rhodes and The Mortal Instruments and The Infernal Devices by Cassandra Clare are the only ones still continue excitedly. Morgan Rhode's Falling Kingdoms continues to tease me and make me happy I am reading. Thanks for this interview. I think Morgan Rhodes is an excellent writer. So I like having a look into her mind through this interview! Looking forward to Gathering Darkness. By the way, pretty sure the 'forbidden romance' of "a scene near the end of Gathering Darkness" might be talking about Lucia and Magnus. I love this series! I can't wait to read gathering darkness. I've wanted to read this series for awhile now. It sounds fantastic. I've heard this series is amazing! Great giveaway! This series looks really great! I like the cover art, they are very intriguing! This sounds amazing and I love the covers! You have the most awesome covers on your books! Thanks for the giveaway!